After finishing my mech a couple of months went by in which I did nothing. 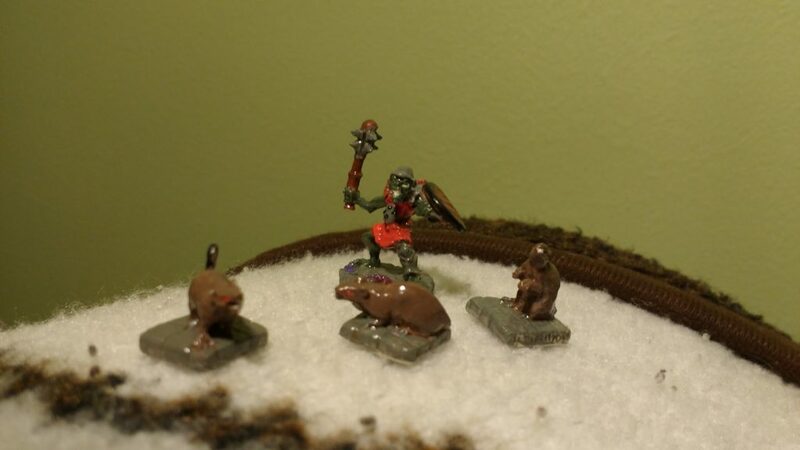 Then, knowing that I had a lot of work to do in order to have miniatures ready for my upcoming Science Fantasy campaign, I started up again by practicing on a Goblin and some Rats. All four miniatures were from the first Reaper Bones Kickstarter which I backed and which marked the beginning of my miniature collection. I had done some more research on priming since my first attempt at painting and now realized that I didn’t need to prime Bones miniatures. Up close it’s easy to see that I definitely needed the practice but from playing distance I was pretty satisfied with how this turned out. They also further sold me on the DIP method as they turned out very durable.